Mike Cross goes in for one of his two tries. The game was a very physical affair and Bosco looked to take control early. This they did, going over for a try and a 7-0 lead. The Braves continued to pressure the Saints into a number of mistakes and played in the Saints end for the majority of the half. The Bosco forwards ran the ball hard with numerous pick and goes and controlled possession, scoring four tries to take a 24-12 lead into the break. The second half was a different story. The Saints cleaned up their play and decreased the errors and the forwards played more as a unit. Charlie Rascon led an improved defensive effort, while in the backs Matt DeFrates made a number of important tackles. Overall, the Saints defensive adjustments, continued high work rate, and improved execution meant Bosco scored only one try in the second half. 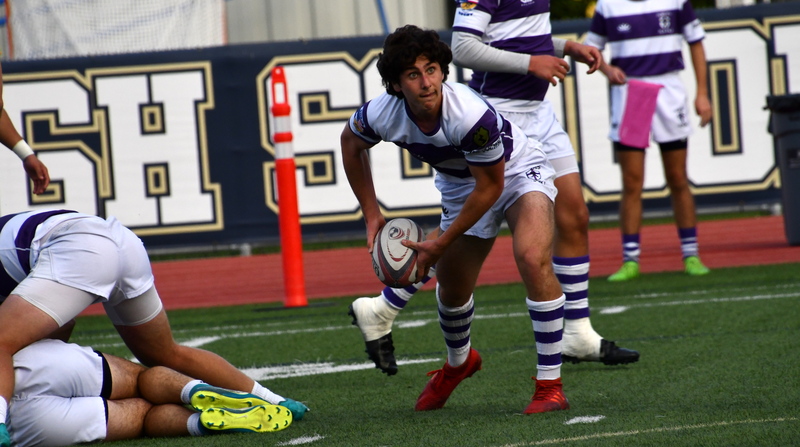 Offensively, the Saints offense was driven by scrumhalf Aidan Konkja, who pushed to Saints attack and whose kicking and running also caused Bosco problem. Jake Armenta emerged as a dangerous option out wide, he in fact he scored the first try of the second half. Senior froward Mike Cross scored twice as St. Augustine outscored Bosco 28-7 in the second half to win 40-31. With that, the Saints sit 4-0 in the SCIRF. Meanwhile, Cathedral Catholic opened up its account with a 40-0 shutout of Mira Costa. Costa came close to scoring several times and missed three penalty goals. Otherwise, the first half might have been much closer. But Cathedral dominated in the second half and pulled aware. La Costa Canyon also pulled off a shutout, beating Fallbrook 33-0.